Llandow Circuit is a small race track located 15 miles south west of Cardiff. Like so many UK motorsport venues, the circuit began life as a World War II airfield. As RAF Llandow, it was home to Spitfires and part of the Canadian Air Force until it was decommissioned in 1957. In 1961 Jack Evans, a local farmer, bought an 80-acre parcel of the land and, with the help of the South Wales Automobile Club, he linked the runways to form a 1-mile oval track. From its opening in 1963, car and motorbike events drew substantial crowds through the 60s and early 70s, but the circuit’s popularity gradually waned and ultimately it fell into disrepair, losing its track licence in 1977. A go-kart track was added, and the main circuit was used for stock car racing, a Race & Rally School, and general testing. Then around the turn of the Century, the owners resurfaced and reshaped the track, and with a few minor modifications it has become a popular venue for sprints, testing and track days. It stubbornly remains privately owned by the descendants of Jack Evans. 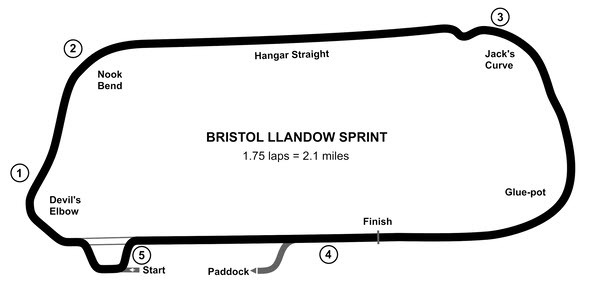 Soon after the circuit regained its MSA Sprint licence in 2001, Bristol Motor Club joined forces with Bristol Pegasus Motor Club to run an annual sprint at the circuit on the late May Bank Holiday. To make the most of the 9m-wide tarmac it was conceived as a 1¾-lap event, making a competitive run of approx. 1.6-miles. From its first running in 2002 the event ran successfully until the recession hit, and a poor entry in 2011 forced the cancellation of the event. Welsh Counties Car Club had been running a sprint on the second Saturday in May, which shared many entries with the Swansea MC hillclimb at Llys-y-Fran on the Sunday of the same weekend. They had also felt the effects of the recession, so for 2012 agreement was reached to co-organise a 3-club event for 2012. The untimely death of Don Statton in 2013 led to the demise of WCCC, and from then on the event has been solely in the hands of the two Bristol Clubs. As with all our competitive events, detailed competitor information, with Supplementary Regulations and Entry Form, will be published on this website a few weeks before the next event.